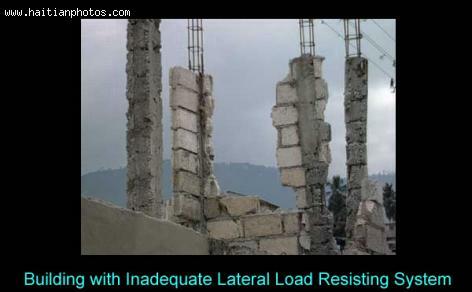 It is estimated that 90% of the buildings in Haiti were made from materials not suited for earthquake resistance. The costs to build a structure that can withstand earthquake tremors can rise to anywhere from 10% to 20% of the building costs. Finding these costs prohibitive, most people opt out of the precaution as they simply can't afford it. The materials most commonly used include a mixture of branches, twigs and sticks called clisse, stone, bricks, earth and cement. Duplicitous contractors will use unrefined sand and limestone dust to make a cheaper, and consequently weaker concrete.